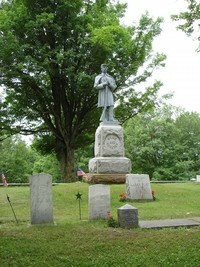 Bayside is a fine example of a "rural cemetery" in Northern New York. A "rural cemetery" is a particular design and a product of a certain era in American history. For more on how Bayside arose in that era, visit "The Beginnings." Bayside Cemetery is outside of town, but to be a "rural" cemetery means more than that: it has been carefully designed as a landscaped, park-like setting. 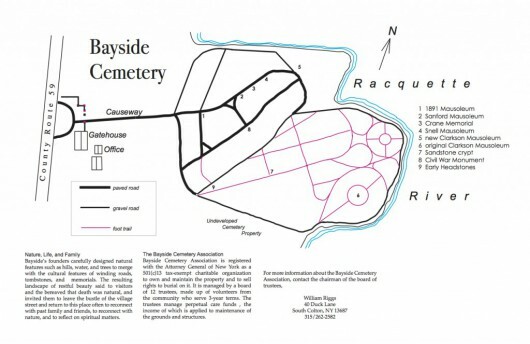 Bayside’s founders introduced natural features such as hills, water, and trees to merge with the cultural features of winding roads, tombstones, and memorials. The resulting landscape of restful beauty communicated to visitors and the bereaved that death was natural, and invited them to leave the bustle of the village street and return to this place often to reconnect with past family and friends, to contemplate nature, and to reflect on spiritual matters. The straight tree-lined allee that visitors follow to enter the burial grounds is intended as a transition from the bustle of daily life (the paved county road) to the more spiritual matters of nature, time, and family on the burial grounds. For more on the tree-lined entry road, click here.